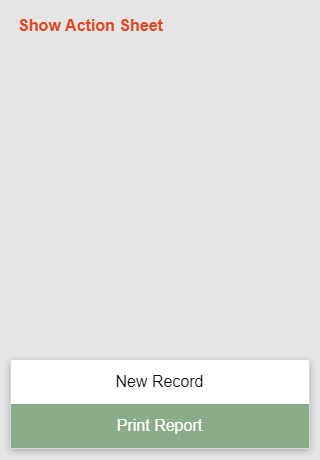 Display a menu styled as an iOS 'Action Sheet'. A common user interface design in iOS mobile applications is the Action Sheet. An action sheet is a series of menu options that animates into display from the bottom of the screen. The menu can be divided into logical sections. Defines the menu items shown in the Action Sheet. The menu items are defined as a JSON string (see "Defining Menu items" below.) Use the Sample JSON definition link in the "Action Sheet - Menu Definition" dialog to insert a sample menu. The width of the Action Sheet defined using CSS units. If left blank, the Action Sheet will automatically fill the available width.. The Action Sheet Menu items is used to define the menu. 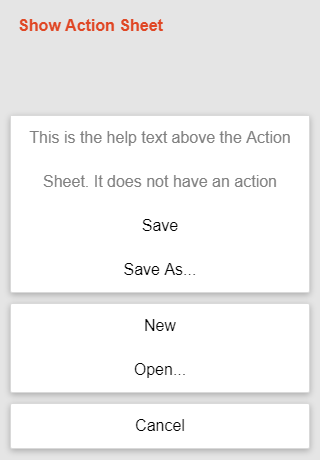 The Action Sheet menu is defined as an array of arrays of JSON. A common user-interface technique in iOS applications is an Action Sheet - a popup menu with a series of options. In this video we show how easy it is to add an Action Sheet style menu to a UX component.